Did you know that you can automatically add Google Analytics tracking to your CommuniGator tracked links? In this article we will show you how to set up some default values so that you can track every click in Google Analytics, as well as CommuniGator. First of all head over to Tools > System Defaults to check out your default values and make sure that the code will be entered as default. Here we can see that Google Analytics is not be added as a default. To do this simply check the tick box. Then to check your default values click on the pencil. Here we can see the values that will be sent through to Google Analytics. This allows us to build up a picture of our visitors and where they have come from. utm_source defines the origin of the visitor. Other example might include search engine or another website domain. utm_medium defines the method of delivery. It is important that this is set to 'email' as it can the be compared to PPC, organic and banners etc. utm_campaign defines the individual campaign within the medium. This allows you to drill down further and compare campaigns without effecting the stats you can gain from utm_medium. utm_term may allow you to compare two subject lines across a split test from the same campaign. utm_content in this case is set to id. As both utm_content and utm_term are optional these are the ones that you may wish to experiment with depending on what information you want pulled through from CommuniGator. 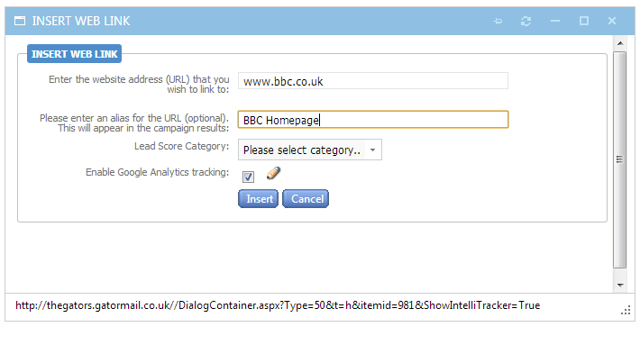 Now when adding a tracked link you will notice that the Google Analytics box is ticked as default. You are also able to click on the pencil here to change the default values for this link specifically.